With his broad business acumen, strong work ethic and pragmatic approach, Jason is able to find the best talent in every search. Drawing from years in sales, customer service, and management for a top rental car company, Jason is determined to achieve results and passionate about serving his clients. 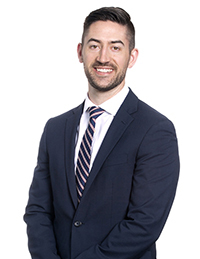 Jason’s professionalism and strong communication skills have resulted in a strong network in the business community, one he brings with him to the Executive Search team at KBRS. Jason holds a Bachelor of Arts with a Major in English from St. Francis Xavier University. While at StFX, Jason stayed well connected to the student body, serving as Vice President of his residence and Co-Manager of the XHL, StFX student ran intramural hockey league. Jason also gave back to the local community volunteering his time with Shinerama and L’Arche House. Outside of the office, Jason keeps an active lifestyle, playing competitive hockey, golfing, and hiking. Believing it’s important to give back to the community you live in, Jason finds ways to donate his time to various charities like the United Way.